Dubbed "Italian Goth Rock", my first introduction to Spiritual Bats was their song, Crucifixion, which is included on the Cleopatra compilation "The Unquiet Grave". Crucifixion is a darkly fun tune that whet my appetite for their latest release, a 5 song EP titled "Sacrament". Sacrament is guitar-laden with spooky wavering synth that makes you feel as if Halloween came early this year. What fun it is to disregard the blazing summer sun and visualize the mists of October wafting through your mind, carried on the strings of Dario's guitar and Matteo's vocals. The cd artwork for Sacrament (by The Alchemisti Painters) is also quite beautiful, sending me longing for those glorious days of vinyl when you could get the full-scale version of such illustrative delights. I not only recommend Spiritual Bats, Sacrament; but please do yourself a favor and also listen to the Unquiet Grave compilation by Cleopatra. 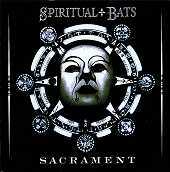 Cleopatra seems to have sifted through the ashes to dig up some very worthy bands, and Spiritual Bats is one of those unearthed gems.